Big names in the banking sector are not having a good Wednesday. Both JPMorgan and Bank of America have seen their share prices drop in early trading on Wednesday. 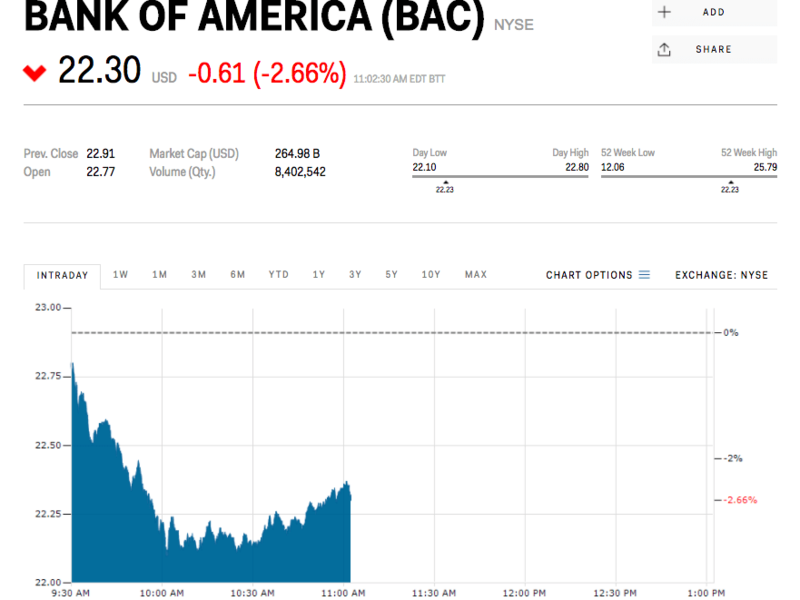 JPMorgan was down about 1.8% and Bank of America was down about 3.3% as of 10:40a.m. ET. The shares started to fall Wednesday morning followingcomments at an investor conference from executives ofboth firms. Markets revenue at JPMorgan is down 15% so far in the second quarter compared to last year, CFO Marianne Lake said, according to Reuters.Lake points to lower volatility this year, compared to the tumultuous situation surrounding Brexit in 2016. She added that U.S. economic growth is “solid, not stellar,” which has contributed to JPMorgan’s lower revenue. Bank of America CEO Brian Moynihan also said trading revenues would be lower in the second quarter compared to last year, according toStephen Alpher of Seeking Alpha. Other banks are down as well. Goldman Sachs is down about 4%, Citigroup is down about 2.4% and Wells Fargo is down about 1.2% on Wednesday. The S&P 500 is down only 0.25%. WWDC is just around the corner, and you know what that means: The big unveiling of iOS 11. In this week’s episode of The iPhone Show, I pick the top three features that would make iOS 11 an absolute must-have. Watch the video above to find out what they are, and whether you agree they are indeed upgrade-worthy. Do you have an ultimate wish-list for iOS 11?Let us know by commenting on Macworld’sFacebook pageandTwitter feed. In October of 2016we dramatically changed our Facebook posting strategy. A gradual, but noticeable shift in manysocial media algorithms and an influx ofbrand advertisingon Facebook meant that it was important for us to either start experimenting or we’d continue to see a decline in organic reach and engagement. Most of last year(Jan-Oct 2016), we were posting a lotto social media, especially on Facebook. A quick sift through our data shows that we were sharing more than 125 postsacross our social media channels (25-40 posts to Facebookalone) on a weekly basis. Part of our thinking was that we could adapt to the ever-changing social media algorithms by simply posting more. It makes sense, right? Theoretically, the more we post, the more that our reach would add up over the course of a week, month, and even the year. However, notice what starts to happen right around October 2016. Our Facebook reach begins to increase at nearly the same time that we began to experiment with our Facebook posting strategy. Not only that, but reach continues to grow as we move into 2017 and beyond. Today, we’re reaching more than 150,000 people per week on Facebook, compared to the 44,000 or so people that we were reaching during most of 2016. For me, this was a ground-breaking and exciting revelation. Itgave me the opportunity to focus on other creative projects like creating videos, launching the Buffer Podcast, and growing our Instagram account. The other unexpected thing that happened (as the chart above shows) was that the number of posts that reached more than 60,000 people and received more than 2,500 unique engagements nearly doubled. That was a massive shift from 2016 when were only reached more than 60,000 people with a single post once. However, this next chart is my favorite one of all. It’s great to have individual data points as a reference, but I wanted to get a big-picture view of what was happening after the Facebook posting strategy change. To do so, I downloaded all Facebook post data using Buffer from January 1, 2016 to April 30, 2017. No small feat! The most surprising of all was how many posts were reaching less than 2,000 people on a consistent basis before October. Before this point, I hadn’t realized just how poor many of our posts were really performing. The more we posted, the worse they did! Between February and March, more than 100 posts reached less than 2,000 people. Take a look what happens to the other categories of reach as time goes on. Posts reaching 2,000-5,000 people stay fairly consistent (which is understandable), but posts reaching 5,000-19,999 and 20,000+ gradually begin to increase and are currently trending upward as of today. In the next few sections, I’d love to share why this was an important (and counterintuitive) change to our Facebook posting strategy as well as exactly what we’re doing today to ensure these results continue. As manysocial media managers know, it’s a consistent challenge to send out lots ofqualitycontent to Facebook every single week. There’s the creation process, the copywriting and scheduling, the monitoring, the engagement with your community the list goes on and on. Yet intuition tells us that the more we post the more engagement and reach we’ll get. It makes total sense (at least we thought it did!). What we found, however, is that the opposite happens with engagement and reach. When trying to fill the queue with content for the simple sake ofposting and having a presence on Facebook, content tends to become diluted and lost in the news feed. For us, posting less didn’t even seem like a viable option at the time. We have a ton of great content going out on the Social and Open Blog each week were we supposed to stop posting that all-together? And that’s where we discovered one key distinction in our Facebook posting strategy:Even though our content may be quality (and awesome), not every post is right for Facebook. Even though our content may be quality (and awesome), not every post is right for Facebook. I’ve found that generally speaking, the most popular posts across Facebook can be categorized as Edu-tainment. They are eitherentertaining or educational. For example, silly GIFs might fall into the entertainment category, while data, how-tos, and infographics fall into the educational category. The best posts of all tend to have a mix of both entertainment and education and those are the ones I’m constantly on the hunt for on social media. I encourage you to experiment with only posting once or twice per day on Facebook. You might be surprised at how quickly your best content filters to the top. Limiting the quantity of posts encourages a deep focus on posting quality, which sends positive signals to the Facebook algorithm. Another great strategy for us has been posting an increased amount ofcurated contentto our Facebook page. Previously, we used to shy away from curated content because it didn’t directly affect the bottom-line: traffic, subscriptions, sales, etc. I’ll be the first to admit that I couldn’t have been more off here. The posts highlighted in a blue rectangle are all pieces of curated content. In other words, 7 of 11 of our most successful posts throughout the last 14 months are curated (not created by Buffer). These posts have combined to reach more than 750,000 people, averaging to about 107,000 people per post. Curated content may not directly affect our bottom line, but it plays a significant role in reach, engagement (likes, comments, shares) and page growth. Which, in time, allows us to deliver Buffer content content that does drive the bottom line to a larger, more engaged audience. Focusingon brand awareness and engagement vs. driving traffic to our website has become a staple of our strategy as well. We’ve witnessed a shiftin many social media networks over the last year. It used to be that brands and businesses could post links to their blog posts and watch the traffic flow in. And while that’s still the case for many publishers, savvy marketerscan benefit from thinking about their content strategy as a whole focusing on both direct traffic as well as engagement. This post also brought more than 1,000 new Likes to our Page many of whom continue to Like and engage with our Page today. Last, but not least, I’d love to address how important Facebook boosted posts have been in increasing reach and engagement on our Page. It is worth noting that our daily budget has not changed over the period of the last year. I.e., our reach and engagement did not increase because of an increased advertising budget. Currently, we spend roughly$40 per day boosting our best-performing content on Facebook. The only difference between last year and this year is the quality of content that has been available to boost. Boosting posts takes content that’s already performing well and amplifies it on a huge scale. As that implies, the key is to focus on boosting great content, not necessarily posts that aren’t doing well and forcing them with advertising dollars. Doing so will ensure that your money is spend in the best way possible. Thanks for reading! Have you experienced something similar with reach and engagement on Facebook? Or, maybe you have a few posting strategies that I missed above? I’d love to continue the conversation with you in the comments below! What has been the best success you’ve found in terms of a Facebook posting strategy? What are your top tips for increasing reach and engagement on Facebook? Since 2013, Michael Hirst’s Vikings has told the epic tales of raiders and explorers of the Dark Ages. Now, fans will be able to enter that world in Hugo’s upcoming release, Vikings: The Game, which will be released worldwide on iOS, Android, and Steam in 2018. Itwill be a player-vs.-player strategy game featuring characters from the TV series, including Ragnar, Lagertha, Floki and Rollo. We are proud to team with MGM Interactive to bring the Vikings phenomenon to mobile gamers, said Huge Games CEO Henrik Klle in a statement. Fans of the show have come to expect drama, action and intensity during each episode and the new Vikings game will deliver those same elements and more. The History Channel broadcasts the show in the U.S., and MGM is the distributor in most of the world. Hugo Games is based in Copenhagen, Denmark. I know this isn’t something that HN probably cares about, but I’ve been a member here for several years and thought I’d share it with you all because, well, writing (and finishing!) a book has been a lifelong dream of mine. And I did it! It’s called The Social Puzzle: Advice on Life & Love. And if you want to buy it, you can use the offer code “hackernews” for $10 off ($9.99 instead of $19.99). I’m debating whether my family should adopt a new pet. About ten years ago, my son picked out a border collie mix at the Humane Society near my house. Abby has been struggling with hip problems lately, but she’s mostly as eager as ever to head out on a walk. Still, she could use a companion other than the humans at home from college this summer and a cat that is only marginally interested in acknowledging her existence. I’m also thinking of moving back to the country. If you must know, we’ve lived in a busy part of Minneapolis for a few years now. Before that, we lived in the country on a five-acre hobby farm. The pets ran wild and free in sun-soaked fields. Here, not so much. If we end up moving soon, we’ll likely adopt another dog or two. (The jury is still deliberating about adopting more cats.) That’s why, when I heard that the Google Home speakerand it’s Assistant bot can guide you through the process, I was interestedand a bit skeptical. I first asked about dog breeds that get along best with cats. The first one listed caught my attention – a Golden Retriever. Interesting. This mild-mannered breed makes sense. I took care of one over the summer as a teenager, and they tend to be calm and subdued. That helped me get rolling on asking a few more questions. I asked about the friendliest bred and the smallest. I asked about nutrition. Everything was working wonderfully so far. However, things started to break down a little. I asked which breed gets along with cats the least, and the Assistant on the speaker didn’t know the answer. That was perplexing to me – why would the bot know the friendliest dog breed for catowners but not the least friendly? It must be a Dobermann Pincher or a Pit Bull, I thought. Who knows? Next, I started asking about where to adopt a pet. This all led to some blank stares from the bot (or at least a few long pauses). Google Home can answer a few basic questions about pets, but also missed a few easy ones. More importantly, it didn’t link the search for a proper breed to the act of actually locating one. That was one major strike again the voicebot market. Google Home did let me ask about pet care. I asked the voicebot about exercising a new dog, which worked fine. Google Home didn’t realize there’s a dog park near my house – kind of off the Google Maps, you might say – and suggested a much more professional one across town. My guess is that Google only knows about dog parks that have a website. Of course, you can’t see pictures of dogs or check on adoption prices. I feel voicebots have become part of my daily routine, but there’s one big issue. For now, it’s a diversion and a bit entertaining. What if it becomes impractical? If the voicebot only helps to an extent, and then we have to retreat to a computer or a smartphone, it ruins the experience. Google Home didn’t help me find a dog, but at least it did help me think about next steps. Once we move, maybe the bot will become advanced enough to complete the entire process. Otherwise, I might end up find a new dog the old-fashioned way – by going to the Humane Society in person and wandering around.